Hello! Welcome to Crew Member Wednesday. Today we have Karin with an explosion of color. I totally love the idea of die cutting circles out of these papers with so many patterns and details and colors. Karin made some beautiful cards with them but just imagine what more you can do with them, like using them in your art journal! Because I'm almost out of cards, I decided to make some. First I made two inked backgrounds (A4) and used a lot of different stamps on it. I edited the stamped prints with markers and a white pen and I also applied some nice glitter to the backgrounds using WOW! FabFoil. I added some accents with a mask. Then I punched everything in circles with a circle punch and glued the circles on a firm piece of paper. I cut the paper into squares and at last I glued the squares onto green cardstock. Hi everyone! It's Crew Member Wednesday and we have Linda today showing an awesome art journal spread. I just love Linda's collage pieces in which she uses people and animals cut from magazines and her use of black and white!! A new year is time for new beginnings and new goals. In the last ten years I’ve picked a word for myself to live by in the start of a new year instead of new year resolutions and I actually find them more effective and uplifting than hard resolutions I usually don’t manage to hold on to through a whole year. This year I picked the word FREE. More about why I choose the word I will share on my personal blog, but the word was a great inspiration for this art journal spread. I just let go and did whatever I felt was right at the time, without any boundaries for myself. I’ve used some of Birgit journaling and flower stamps to create interesting creatures and I hope you like it. When the papers are glued down I add white gesso on part of the background. I’ve decided to add some collage to the page, so this is some of the choices I gave myself. I didn’t end up using all of these, but some. Before I put down the collage I added some stamping on the background, I knew I would have some of the horse on top of this. When all the collage and stamping is done it is time for doodling. Hello! It's Crew Member Wednesday again and today it's Marsha's turn with a really cool holiday season project! I am totally in love with her colourful stars and the best part is they are super easy to make! And why not use hearts or flags to create a birthday banner? Have fun creating your own eye catching banner! Hi there! It’s Marsha Valk here today with a project that will add a dash of mixed media to your holiday decor. This month the theme is ‘Imagine a World Where…’ And that got me I thinking: the holiday season is approaching fast (or maybe it has already started for you). Your creative playtime could be limited over the next couple of weeks. Now imagine a world where... you could sneak in a bit of mixed media me-time whilst working on holiday decorations! The cardboard stars I used were pre-cut and came in a sheet, but you can easily cut them yourself from a cardboard box. I suggest painting the cardboard panel first so you can cut the stars out of the painted board. Apply (random) patches of paint all over the cardboard. Keep your colour palette limited to just cool or just warm colours and try not to overthink this step. Add a layer of stencilled images. Switch from cool to warm or from warm to cool colours, depending on what you used in step 1. Add a third layer by making paint marks with a brush or paint markers. Cut the stars (or remove them from the pre-cut sheet). Stamp one or more images onto each star using embossing ink. Sprinkle white embossing powder on top, tap off the excess powder and heat set with a heat tool. Attach string to each of the stars and find them a beautiful place to shine! Make sure to drop by every Wednesday for ongoing inspiration from my fabulous Crew! BMMAC 2018, Proudly Announcing My New Art Crew! Hello and welcome to my blog! Today is a happy day! Because today I am proudly announcing my Art Crew for 2018! Birgit's Mixed Media Art Crew is a team of wonderful artists who create beautiful art work using my product designs for Carabelle Studio. The team is providing inspiration for art journaling, mixed media, scrapbooking, card making and more on a weekly base here on the blog. The first team started in May of this year and now I am happy to introduce to you the new crew starting January 2018! We are saying goodbye to Marsha. I'm sad to see her go, but new adventures and challenges are awaiting her for 2018 and I wish her good luck with everything. Marsha we will miss you and your gorgeous projects. Thank you so much for everything you did for the crew this year! Karin, Linda, Hermien and Femke decided to stay on the weekly crew for another year and I am really, really happy about that as they all are very talented and I know they will continue to inspire you with their original and beautiful art every Wednesday! I'm very excited about our new addition to the weekly crew, Karen Gaunt! Karen is very talented and I love her art, her unique style and her use of color and words. I am very happy to welcome her on board! Besides the weekly crew I'm introducing to you 3 wonderful guest designers. These ladies, Revlie Schuit, DeeDee Catron and Andrea Ockey, will provide blog posts every first Saturday of the month. Each of them has their own unique style and way of using products. Like the rest of the crew they are an ongoing source of inspiration and I am thrilled to have them on my team! Please let me introduce to you my amazing Art Crew ***drum rolls*** !! Hi There! I’m Karen and most days you can find me covered in paint and trying to keep the cat from knocking over my dirty paint water. I'm a full time artist and Mummy and I love nothing more than creating with my young daughter by my side. I am mostly known for my dramatic victorians and of course my found poems. When it comes to my artwork if it doesn't have a found poem on it, it didn't happen. If you're going to come create with me be sure to bring along your fluorescent colors and gelli plates too. The things I am most passionate about in life are encouraging and teaching others to pick up their paint brushes and just get started in their mixed media and Art Journaling adventures. I’ve always loved Art and creating ever since I was a child, it’s my happy place. I just want to each crunchy peanut butter all day and help you create something amazing! Woman, married, humor, challenges, creative, practical, MS&MG (both 'neurological challenges' in my life) , and so much more..! Since last year Puck and Panter (two cats) joined our household, so now we are officially employees ;-) (Unfortunately Puck recently died). I love to get my hands dirty (sometimes very ;-)) making cards, stamping, painting, gelliprinting , just go with the flow.. ! I am very honored to be a member of Birgit's Mixed Media Crew! Hope you enjoy! My name is Karin van den Broek and I live in the middle of the Netherlands with my partner and 19 year old daughter. I started making cards about 6 years ago and one thing led to another and now I can't imagine a life without stained fingers. I love to experiment with ink, paint, stamps and templates and I mostly use bright colors. I love Birgit’s work and I’m honored that she asked me as a crew member. My name is Linda Brun, I am a mixed media artist with great passion for artjournaling and monoprinting. I live in Sandnes, Norway with my husband and dog. I’m a graphic designer, working full time as an artist through mixed media collages and paintings, working from my home based studio. Teach hands on mixed media classes and work as a creative inspirator when asked. I also try to fit my mixed media art in to bookbinding, scrapbooking and sewing. I love diving in to art technique books and take art classes with other artists. I’m always on the look for new techniques and tools to try and I find myself working with various kind of mediums and colors. Today I’m in to stamps, acrylic, masks and gelliprinting. Tomorrow might be different and that is what I like with my creative journey. I’m so happy to be a member of this fantastic crew and look forward to another year with great fun and inspiration. Hi there! Nice to meet you. My name is Femke Kokke and I am a mom of three kids (11, 4 and 4) and I am a freelancer in youth care and helping adults with psychic problems. Besides being a provider, I also am a scrapaholic :) I love scrapbooking, I really do. I started Scrapbooking in 2003. First I did not use any paint at all. But since 2 years that changed dramatically into using Mixed Media like almost all the time. Suddenly I love paint, stamps, gesso, stencils and doing all kind off techniques. So I now love Mixed Media Scrapbooking and am very happy to be a part of Birgit’s team and creating nice stuff to show you! DeeDee Catron is a mixed media artist, instructor & product designer residing in Las Vegas, NV. She’s been submerged in aspects of the art industry her entire life… drawing, painting, digital graphics, ceramics, fiber arts, drafting, product design, wood working, metal smithing and more. In college her best friend & roommate introduced her to card making and her artsy endeavors grew to include paper crafts. Now her mixed media arts are a delightful mixing pot of all things color & texture. 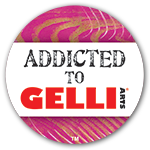 She loves gelli printing, stitching, collaging, stamps, chipboard & in reality the list would be ever ending. I’m Andrea Ockey Parr, a late-night crafter living in the great state of Utah in the United States. I come from a line of amazing women who did pottery, quilting, painting, costume-sewing and all sorts of intricate hand-work. While I can’t follow a sewing pattern to save my life, I’m so grateful for their example and influence. I’m also grateful to be a wife and mother, a medical laboratorian, a former English teacher and an eternal librarian. No matter what I’m doing in life, art is what keeps me grounded and sane. In my projects, I gravitate toward bright bold colors and whimsical themes with a touch of grungy-stringy-wonkiness. My favorite mediums are paint and ink and I often incorporate fabric scraps and stitching into my projects. I’m lucky to have had my work featured in over 50 publications, including Cloth Paper Scissors, Somerset Studio, and Art Journaling. Don't you think this crew is just amazing?! If you want to keep updated on what the crew creates and also share your own work using my products for Carabelle Studio then please join our BMMAC Facebook group! We would LOVE to see what you create! Thank you for stopping by and have a wonderful day!! It's Crew member Wednesday again and it's Karin's turn. This month she created some beautiful cards. I love the colors and how the combine with the lovely shiny gold! For the love of layers.. I didn’t know what I was going to make, but I just started and I ended with a bunch of cards! A few days earlier I tore two pieces of paper out of an advertising brochure, because I liked the colors and today I used them in my background. I started with applying the torn pieces of paper from the advertising on a piece of cardstock. Then I used a mask with white gesso and another mask with black gesso. Then I added some more color to it, using turquoise ink. I decided to make some marks with gold paint and I also splattered some white ink on top. At this point I decided to cut the paper in squares and make cards out of them. As a finishing touch I added the little hearts. Make sure to drop by every Wednesday for ongoing inspiration by my fabulous Crew! From Tuesday November 7 to Thursday November 9 I will be teaching a 3-day! workshop in my studio. The workshop will be taught in English as there are 3 international sign ups already. Also, you will get loads of info about the products you will work with. Price for this 3-day workshop is € 210,= and includes all materials you need (you don’t have to bring anything! ), a small goodie bag, lunch, drinks and snacks on all days. If you need help to find a place to stay in the area or have questions about public transport or anything else, I will be happy to help you out. I would love to welcome you in my studio! Happy Wednesday and welcome to the blog! Today we have Linda with a beautiful mixed media collage piece. Don't you just love all those stitched layers and the cute tea bag labels she included?! Watch the video to see how Linda prepared her papers and created the collage with them. Hello there, this is Linda! It’s “For the love of colour” this month and I want to show how I add colour and marks to various pale coloured surfaces. I love how tea beautifully makes marks on used tea bags and every tea creates a different colour. And what about the great effect white and black ink marks have on recycled craft paper. On this collage project I wanted to try out a new product. I’ve had it for a while, but never used it. It’s Lutradur – a non-woven stabilizer. I used two different kinds I wanted to try. I had a great Gelli® print left over from my first project with BMMAC and wanted to use it for this project. I scanned it and then printed it on to the thickest kind of Lutradur 100g. The thinner variant I covered with a thin layer of gel medium before stamping on it. Not sure if I had to do it, but I did. The vintage photo is scanned and then printed on a sheet of canvas, I then glued it down with gel medium and added colour to it with Oil pastels. There where so many different processes here so it was easier for me to take pictures during the process and then make a video with text and pictures. I hope you like it and of course any feedback or questions are welcome. The collage is mounted to a black background. I thought it looked better than on a white background. It made the colours and texture pop. Love the text on the hanging teabag labels so I used them as they were. The paper behind the photo is a paper I used to clean of the brayer when creating collage paper for another project. Here you can see the stitches and how I coloured the photo with oil pastels. Here you can see the 3 layers of the heart in three different materials and colours. Love the colour of the used teabags and it looks great with the pink and purple.